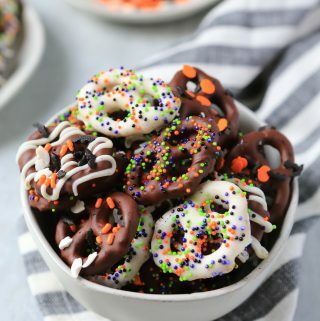 Chocolate covered pretzels are the perfect little treat to serve at a party or pack in your kids’ lunches and they are easy to decorate for any holiday. So grab your favorite gluten-free pretzels, allergy-friendly chocolate chips and some sprinkles. That’s all you need. Pour chocolate chips into a bowl. Use separate bowls for the chocolate and white chips. Melt in the microwave on 30 second intervals, stirring occasionally. After chocolate chips are melted, add 1/2 tablespoon of palm oil shortening to each of the bowls of melted chocolate. Add pretzels to melted chocolate making sure to complete coat. Remove with a fork and place on a drying rack over parchment paper to catch drippings. White still wet, add sprinkles. Place in freezer about 20 minutes to harden the chocolate again.